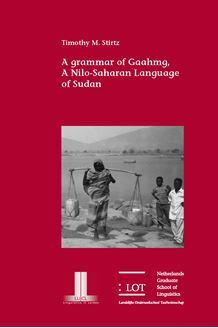 This thesis investigates the grammar of Gaahmg, a Nilo-Saharan, Eastern Sudanic language spoken in the Blue Nile Province of North Sudan. The comprehensive description provides an analysis of the phonology, morphology, and syntax. Ten texts of various genre are given to help illustrated the grammar in context. Gaahmg is morphologically rich, employing many suffixes and clitics on nouns, adjectives, and verbs. Tone and [ATR] quality distinguish a significant number of lexemes and grammatical functions. Several specific processes of consonant weakening, vowel elision, [+ATR] spreading, [+round] spreading, and morpho logical tone rules, account for the vast majority of alternations when morphemes are combined. The syntax is equally interesting. Agentive passive, agentless passive, antipas sive, and causative verb forms are syntactically and morphologically distinct and combine in nearly all possible ways. All pronouns use vowel features to represent the person referred to, the three persons coinciding with the language’s three vowel harmony pairs. Body part locatives are similar in form and mean ing to inherently possessed body part nouns, but are a distinct lexical category in form and function. These and other features make the description a valuable resource for Nilo-Saharan linguists as well as those interested in the typology of African languages.